Leftover turkey does not have to mean turkey sandwiches every day between Boxing Day and New Years’ Eve. All it takes is a few new ideas to use up your leftover turkey and you can actually have a few days where making dinner is a little easier, which is especially welcome after the hectic run up to Christmas. Using your leftover turkey wisely is also a great way to get good value for your money. You can buy a turkey as big as fits in your oven for the big feast on Christmas Day and then enjoy it for a few days – all you’ll need to do is make sure you have the various bits and pieces listed below to turn your leftovers into something delicious! As you do with your Sunday roast joint, you can make a stock from the bones and freeze for future use. Simply simmer the bones for two to three hours with any left over vegetables and an onion. Strain it and then freeze the liquid stock. It’s really easy to have the ingredients you need to make turkey burgers in the cupboard or fridge, without taking up too much valuable space over the Christmas feast. To make delicious burgers, all you need to do is chop up some left-over turkey and mix it with a chopped onion and some breadcrumbs. Stir in an egg and use your hands to shape it into burger patties. Fry the patties gently over a low heat, turning after about four minutes. While they’re cooking, toast burger buns (easy to keep these in the freezer) and spread with whatever condiments you like – mayonnaise and mustard works well – and lay a slice of tomato and chopped onion or gherkin on top. If you like, you can add a slice of cheese (Swiss cheese or emmenthal works well with the turkey) on top of the burger for the last 30 seconds in the pan. Pop your burger on top of the bottom half of the bun, add the top half and enjoy! If you’ve only got a little bit of turkey meat left but don’t want to see it go to waste, try chopping it finely and mixing it with some sweetcorn and mayonnaise (or tinned condensed soup – mushroom flavour is ideal) and then using this mixture to fill vol au vent cases, pancakes or a puff pastry tart case. What great addition to serve with your New Year's Eve buffet. This pie can be made a day or two (at the most) after Christmas and then frozen. Line a pie dish with short crust pastry using around 8oz of flour (or have some ready roll stocked in the freezer before Christmas) - you can then partially bake this 'blind' if you wish but it's not essential. Mix your cooked leftover turkey with some left over cooked ham or bacon. Finely chop an onion and fry gently. Add all the ingredients to roux based sauce and season , then fill the pie dish and cover with a pastry lid, making a hole on top to allow the steam through. Brush with beaten egg and cook for around half an hour or until the pie is golden at around 200ºC. Once the pie is cooled, cover and freeze. Bring out and defrost for 24 hours before eating. A fragrant, creamy Thai curry is the perfect way to use up some of the turkey meat (white and brown work well here, so it’s worth taking your time to take any left over meat from the thighs), especially as it’s so different to much of the traditional Christmas fayre. 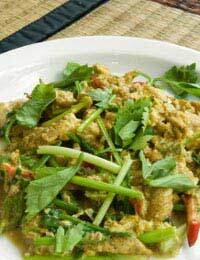 You can, of course, make your own Thai curry paste (there are plenty of good recipes around) but there are some really good ready made pastes available. Rather than choosing a UK supermarket brand, try going to your local oriental supermarket (or buy online) for a Thai brand (try Mae Ploy) – you’ll really notice the difference. Simply fry a dessertspoon of the paste in a little oil, add a sliced onion, cook for a few minutes then add your turkey meat. Pour in a tin of coconut milk and another tin-full of water (add in some Asian chicken stock powder if you have it), a teaspoon of sugar and any vegetables you like (peas, sugar-snap peas and carrots all work well). Leave to simmer for about 15 minutes while you cook some jasmine rice. At the last minute, add in a good shake of fish sauce and a squeeze of lime juice. Perfect served with a cold beer! Check out some more Christmas food ideas here.